E00746. 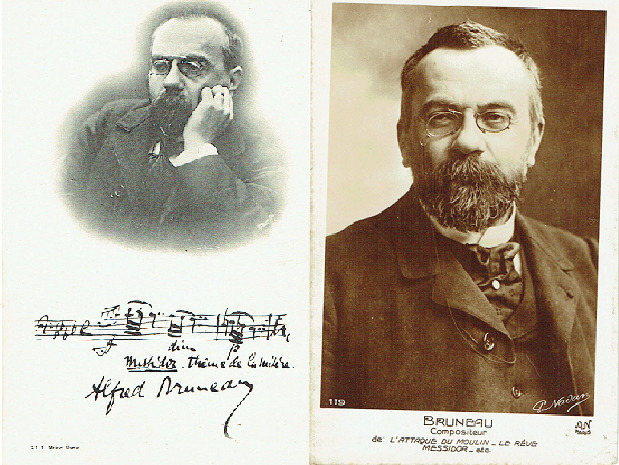 Bruneau, Alfred - signed sepia Benque, Paris mounted cabinet photo, image slightly trimmed on bottom, 4.25x6 / signed written telégramme from Bruneau to Emmanuel Chabrier, Paris, 4.5x5.25 / signed 2-face folded note regarding Emma Calvé, September 2, 1900, 4.5x7 / unsigned sepia photo postcard with music inscription, 3.5x5.5. / unsigned sepia Nadar photo card, A.N Paris (119) 3.5x5.5.